The interferometer is located in the radioastronomical site of Humain which belongs to the Royal Observatory of Belgium. The white squares indicate the approximate position of the 5 antennas. Along each orthogonal axis, the antennas are separated by 2 and 2.5 times the wavelength (6m). The horizontal axe is oriented East-West. The power is supplied from the old parabolic antenna located in the center of the image. 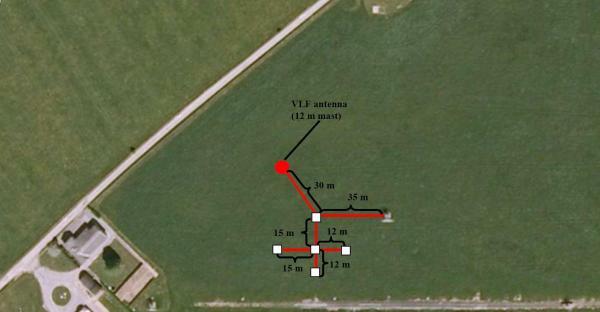 The red circle indicates the position of a VLF antenna that is used to detect whistlers but we plan also to look for simultaneous VLF emissions and VHF meteor echoes. 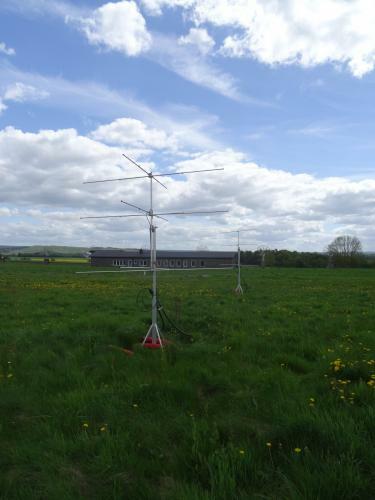 All antennas are mounted vertically in order to ensure that the radiation pattern is close to the theoretical one and to decrease the influence of the ground. 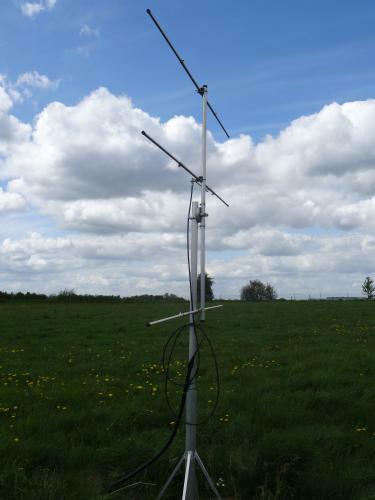 Below is a picture of the North antenna showing the 3 elements mounted vertically. Below are more pictures showing the antenna in Humain. On the left hand side, we see the central crossed Yagi antenna and the south antenna (along N-S axis) while on the right hand side, we see the west antenna in front and the north antenna in the background. Also visible are our container and the VLF antenna.